The Leadership Council for Human Rights (LCHR) seeks to encourage and promote information and action campaigns on the behalf of ethnic and religious persecuted peoples, providing assistance to organizations and individuals under threat. Our goal is reach out to groups and individuals to educate, communicate, train and increase effectiveness on human rights issues by bringing together disparate individuals and groups in a more inclusive, informed and effective manner. Our philosophy, “feet in the mud, head in the sky,” means that we are committed to working on the ground with real people, and to bringing their voices and the stories of their struggles to decision makers in Washington, DC. We aim to cast a bright light on injustices cloaked in darkness through coalition building within the human rights community. LCHR’s projects are as varied as the individual groups we seek to serve. 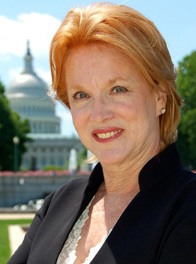 Kathryn Cameron Porter has served as a congressional chief of staff, electoral campaign manager, non-profit executive and consultant, and US presidential appointee. She knows how to connect the dots and make things happen from on the ground projects in Afghanistan to business opportunities in Iraq and Kurdistan, and the possibilities inherent in moving issues in Congress and the Federal Government. Kathryn Cameron Porter founded The Leadership Council for Human Rights in 2001. She is an applied anthropologist with an extensive background in political, cultural and social projects. Kathryn continues to serve as the voice of the voiceless in an effort to bring about positive change in the world. Her efforts focus on women in peace-building, sustainable development, and creative strategies to bring about positive change. Her approach is hands on and focuses on realistic objectives with a sound record of success. The Leadership Council has become a catalyst for both human rights and human responsibilities throughout the world. Kathryn has working contacts in the Middle East and North Africa, Central and South America, Eastern Europe, Asia and South Asia. She is an expert on the Kurds in Iraq, Turkey, Iran and Syria. Her focus has given voice to ethnic and religious minorities in a variety of areas – she considers women as a minority in much of the world.